Rising incidence of chronic diseases, a rapidly ageing population in developed nations, and a growing number of surgical procedures are all responsible for the growth of the IV equipment market. In addition to this, there is an urgent need of ambulatory infusion pumps on account of the shift in preference towards home care. 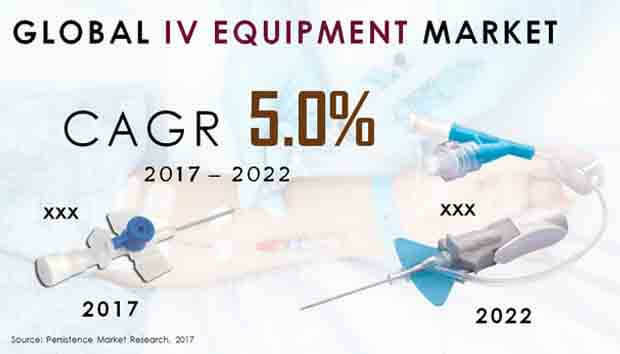 Persistence Market Research has conducted an in-depth assessment of the IV equipment market in its upcoming report titled ‘IV Equipment Market: Global Industry Analysis (2012-2016) & Forecast (2017-2022)’. A historical evaluation for the four-year period ending in 2016 has been presented in tandem with the forecast period from 2017 to 2022 to give readers a complete picture of the present and future prospects in the IV equipment market. An important chapter in the IV equipment market report focuses on the product type forecast and analysis. Y-o-Y growth comparison, revenue, and market share have been detailed for all eight product types in the IV equipment market report. A key stakeholder that wishes to target only a specific product type within the IV equipment market could find this section very useful indeed. The IV equipment market report has given an adequate amount of attention to both developing as well as developed countries. The emerging economies to look out for include Latin America, MEA, and APEJ while the developed regions comprise Europe, North America, and Japan. Each region has a section wherein revenue statistics have been highlighted. The forecast allows readers to gain an in-depth understanding of the IV equipment market. Special attention has been given to the largest countries within each region making it relatively easy for companies that want to enter certain geographies with the maximum potential in the IV equipment market. A competition analysis is absolutely critical in the case of the IV equipment market and the competition dashboard section serves this need effectively. Prominent companies actively involved in the IV equipment market have been profiled in the report. Strategies adopted, company financials, a brief overview, and recent developments that have an impact on the IV equipment market as a whole have been mentioned. A SWOT analysis of the completion is essential for taking actionable insights leading to informed decision-making. The IV equipment market report begins with the executive summary that is both concise and comprehensive. The summary perfectly encapsulates the IV equipment market in a holistic manner and is complemented by the market overview that includes the taxonomy and definition of the IV equipment market. The IV equipment market report consists of the market dynamics, size and Y-o-Y growth rate observed in the IV equipment market. Key metrics such as absolute dollar opportunity and CAGR have been used in the IV equipment market report that has further discussed the relationship between various nodes of the supply chain in the IV equipment market. An ageing population suffering from chronic diseases, particularly in developed regions, is anticipated to demand ever-more surgical procedures. IV therapy is one of the best choices available and this should benefit companies in the IV equipment market. Strong economic growth in Latin America and APEJ are expected to provide significant growth opportunities for companies actively involved in the IV equipment market. Nonetheless, rising prevalence of medication errors, strict regulatory requirements for new equipment and the absence of wireless connectivity in surgical centers and hospitals could stifle the growth in the IV equipment market. The IV equipment market is predicted to record a steady CAGR of 5.0% from 2017 to 2022. The IV catheter segment accounted for a revenue share approaching one-third of the IV equipment market by product type in 2017 and may gain market share going forward. The IV catheter segment is poised to be worth just under US$ 3.5 billion at the end of the forecast period in 2022, making it large enough for all stakeholders in the IV equipment market. Infusion pumps follow IV catheters in the IV equipment market and have a revenue share of approx. a sixth in terms of product type segment. Europe is the largest region in the infusion pumps market as the continent has a well-developed medical infrastructure coupled with a geriatric population that would naturally demand such treatment. A similar potential exists in the securement devices segment and the stopcocks & valve segments of the IV equipment market as they both have minimal revenue share in 2017. However, the securement devices segment is estimated to lose market share over the course of the forecast period while the stopcocks & valve segment is assessed to gain share. An absolute dollar opportunity of more than US$ 270 million exists in the stopcocks & valve segment of the IV equipment market from the year 2017 to 2022. Along with Europe, companies are advised to target APEJ as the region could record the highest CAGR for the five-year study period. As the region becomes more affluent, consumers there might demand better healthcare services and IV equipment should ready to take advantage of this. The drip chamber and needleless connector segment seem to be losing popularity as they represent a single digit revenue share in the IV equipment market and are still bleeding share. Therefore, it wouldn’t be surprising if companies in the IV equipment market decided to overlook these two product types entirely in favor of more lucrative options in the IV equipment market. A comparatively higher CAGR of more than 4.5% is likely to be witnessed in the drip chamber segment and companies are recommended to take this into account while formulating their strategies. Persistence Market Research has profiled a few of the companies in the IV equipment market. These include Becton, Dickinson and Company, B. Braun Melsungen AG, Fresenius SE & Co. KGaA, Baxter International Inc., Smiths Group, ICU Medical, C. R. Bard, Terumo Corporation, Moog Inc., and AngioDynamics.